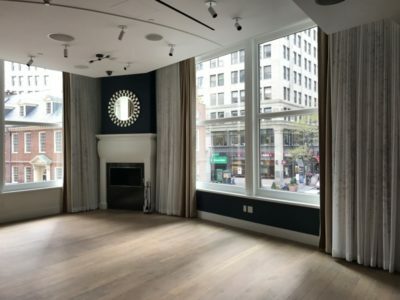 This is my review of the Ames Boston Hotel, part of Hilton’s Curio Collection. We asked Hilton if they could help out with some accommodation in Boston after my Aer Lingus flight. 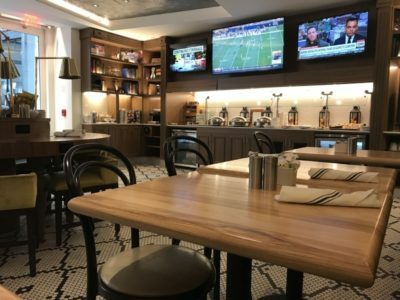 They offered me two nights with breakfast in the Ames Boston Hotel, which joined Curio Collection by Hilton in Summer 2016. HFP paid all of its other costs. I had already stayed at one Curio Collection property this year, the Gran Hotel Montesol Ibiza which I reviewed – positively – here. As you can see from the Curio Collection website here, it is the equivalent of Starwood’s ‘Tribute’ or Marriott’s ‘Autograph’ chains. It consists of luxurious independent hotels which retain a high degree of autonomy in how they operate day to day, are very lightly branded but can still benefit from Hilton’s marketing scale. This includes allowing you to earn or redeem Hilton Honors points on your stays. 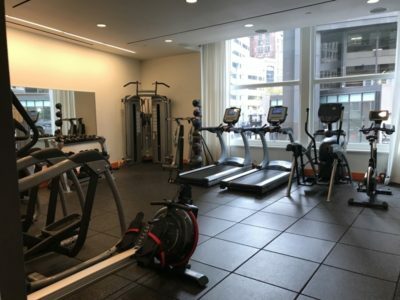 Even though this was my first trip to Boston and I’m therefore not familiar with the city, I would say that the Ames Boston Hotel in Downtown Boston is in a perfect location to explore. Faneuil Hall Marketplace is just around the corner, there’s a large shopping street pretty much outside the hotel and you can join the Freedom Trail walking tour in the parallel street. The hotel also offers free bike rental if you are up for it. I had a very brief stay at the Hilton Boston Logan Airport hotel the night before, which HFP paid for. I was hardly awake in hotel so I can’t review it objectively, except to say that it scores on convenience (attached to the airport) but has a very 1980’s feel. I took a taxi from outside the hotel to get to the Ames Boston Hotel. The ride ended up costing $30 whilst my return ride back to the airport, in an Uber, was just $15. Uber wins. You live, you learn. Built in 1893 the 15-story high Ames Building was Boston’s first skyscraper. In 1974 it was added to the National Register of Historic Places and designated as a Boston Landmark in 1993. The Ames Building was sold in 2007 and after undergoing complete renovations it opened as the luxury Ames Boston Hotel in 2009. 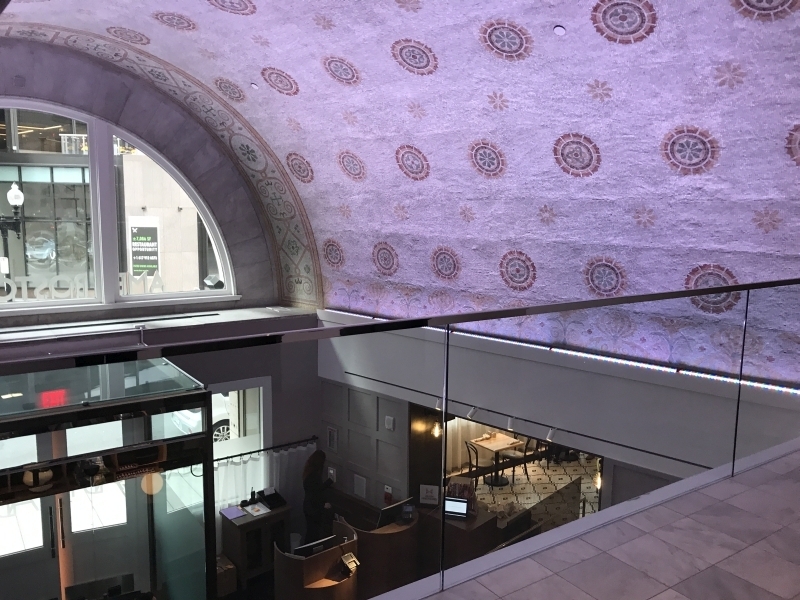 In July 2016, after further refurbishments, the Ames Boston Hotel became part of Hilton’s Curio Collection portfolio. The reception is tucked away in between the entrance doors and the breakfast room (which doubles as an all day coffee lounge). As the hotel is fairly small there was only one receptionist at most times although I was lucky and found two on duty when I arrived. The check in process was quick and painless with me handing over my passport and getting $150 charged to my credit card for authorisation purposes. I asked for a map of the Freedom Trail as that was one of the things on my ‘to see’ list, as well as a trip to the USS Constitution. The Ames Boston Hotel has 114 rooms including 11 suites, of which the Presidential Suite is a full one-bedroom apartment. I stayed in a King Deluxe which is one level above a standard room. These are advertised as “from 250 square feet” but they clearly vary as mine was bigger and a decent size for a city hotel. The walls were black which could have made the room look very dark and depressing, but with light brown wooden flooring, a white ceiling and two fairly large windows the room was actually rather inviting. Wi-fi was complimentary and a good speed for voice calls, Netflix and emails. The bathroom was a cubicle inside the room with a glass wall in between the walk in shower and the bedroom. The bathroom door is on the side. There was no bathtub – only a few rooms in the hotel have one. 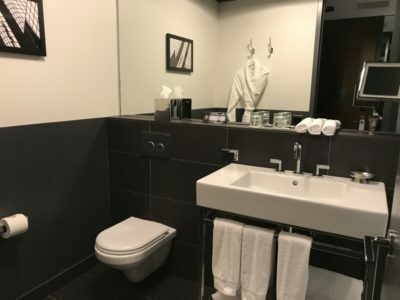 As I was travelling alone I didn’t mind the ‘open’ bathroom, but there was a white curtain that can cover the bathroom if necessary. The bathroom had a full length mirror which made it appear bigger than it was. In front of the mirror was a lot of space for make up, wash bag etc. 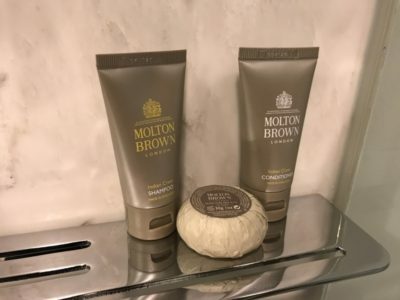 The shampoo and conditioner were by Molton Brown. There was no liquid shower gel, oddly, and as I still had some left from the Hilton at the airport I never got to use the soap bar. The bed was comfortable with the usual four pillows to choose from, of which two have to sleep on the floor at night. There were two bedside tables with lamps that reminded me of old street lights and hark back to the Victorian roots of the building. Opposite the bed was a good size desk with a chair as well as a sitting area with armchair and coffee table. Using the app Stayconnect I connected my phone with the TV and was able to watch Netflix on the big screen. This was impressive. You could also purchase movies via the app but at $10 for an old movie and $20 for a new one, I found this overpriced. In between the entrance door and the bathroom door was the wardrobe with ironing board, minibar and safe. There was no socket around that area and I had to take the coffee machine out of the cupboard and plug it in next to the bed to make a coffee. The coffee was good, with a typical American style machine using a pad akin to a large tea bag. I just don’t understand America’s obsession with takeaway cups in hotel rooms, especially when the hotel offers free coffee in the breakfast room all day. In my hotel room, I’d much rather drink coffee from a real mug. 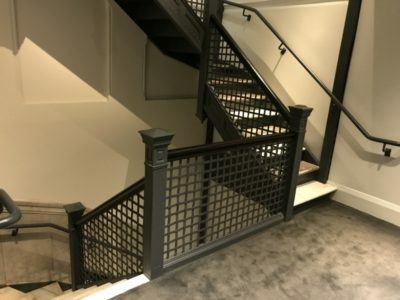 The staircase next to the lift was one of the original features of the building which has been retained. I asked to see one of the suites. The picture below shows the living room area. The bedroom and bathroom were almost identical to the ones in my room. The hotel has two meeting rooms which can be combined into one big space. Ames, the room in the picture below, was very bright thanks to almost floor to ceiling windows and even had a functioning fire place. 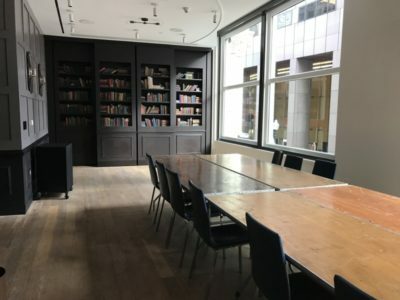 The Oliver & Oakes meeting room looked like an old library with real books on the shelves. The breakfast buffet in the area next to the reception was served from 6:30am – 10:30am. 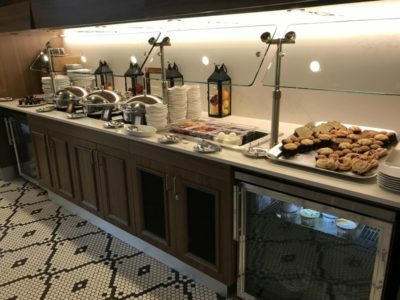 It is free for Hilton Diamond members, and Gold members can choose free breakfast as their ‘My Way’ benefit. For everyone else it costs $18 per person. Typically American, there was a huge selection of cereals, flat square sausages, potatoes and eggs. There was also a good selection of yoghurt, fruit and bread as well as a selection of muffins and cakes. I would have loved to see some cheese or cold cuts, but the only things to put on bread were cream cheese, peanut butter and jam. The coffee machine was free to use for all guests all day long and had a pile of take away cups next to it so you can make a coffee before leaving the hotel. This is a simple and low cost gesture for the hotel but one that I appreciated. 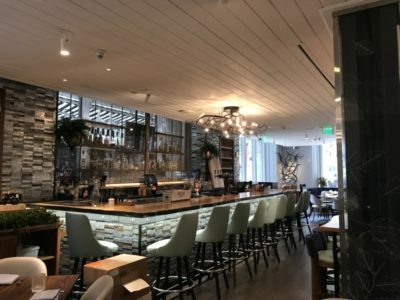 Travelling on my own, I didn’t have the urge to eat in the hotel’s new restaurant Cultivar but I did like the botanical design. Given that you are in the centre of Downtown there is no shortage of other dining options. The gym was nice and bright thanks to large windows and had all the standard machines you would expect to find in a good hotel gym. I edited a few clips into a short video that hopefully gives a good impression of the Ames Boston Hotel. You can subscribe to our YouTube channel via this page – this is the same link to visit if the video does not automatically appear below. 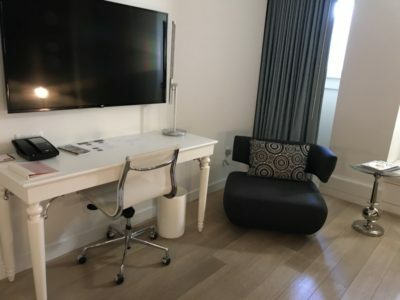 ConclusionThe Ames Boston Hotel is an impressive boutique hotel with lovely staff which is well placed in a great location for exploring Boston. As my second Curio Collection stay this year, I have begun to feel very positive about the brand. 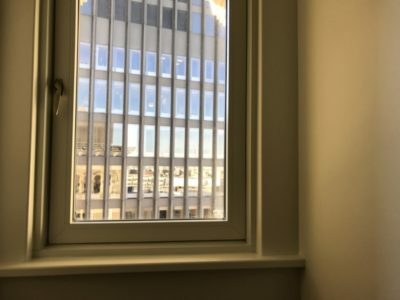 The quality of properties appears to be high and, with a greater degree of independence to divert from Hilton ‘brand standards’, there is always an element of quirkiness or surprise. Whilst Rob had a terrible time at the Hamburg Curio (Reichshof) during its bodged opening – see here – I know his wife has been there more recently and raved about the Art Nouveau interiors. Being able to combine a degree of independence and original style together with the ability to apply your Hilton Honors status benefits and earn or redeem points appears to be a winning combination. You can see why Starwood’s ‘Tribute’ and Marriott’s ‘Autograph’ brands have been equally successful. 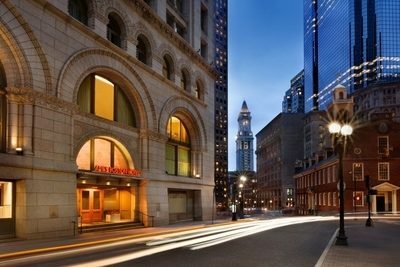 A standard room at the Ames Boston Hotel costs up to 70,000 Hilton Honors points. A typical weekend cash rate, booked now for March 2018, was $339 + 14.45% tax per night, so a redemption is good value. 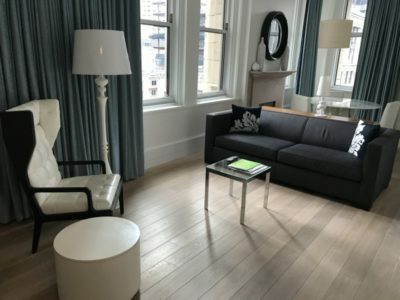 Cash prices can get a little crazy (the weekend of 6th-8th May is $689 plus tax for a standard room, perhaps due to graduation ceremonies) which makes 70,000 points an exceptional deal. The Ames Boston Hotel website is here if you want to find out more. TODAY ONLY - Win one of five copies of "How To Land A Plane"
I dont get this hotel? I looks like any standard chain hotel? I’ve stayed in a newly refurbished Holiday Inn Express that had a larger room and looked nearly identical? For that price you can stay in MUCH nicer hotels in Boston. Lots of comments saying May and autumn aren’t great times to visit… so when is? For clarity I want inexpensive hotels but not the winter cold! You don’t mention the horrific traffic noise and street noise which is compounded by the shape and location of the building? You feel as if the pedestrians are in your room? I am not in the office today, but Anika did not have a bad word to say about it to me. We only review places which have a good reputation – life is too short and I would not send my staff to a substandard property in any event. You give excellent reviews when given freebies and more honest ones when you pay. 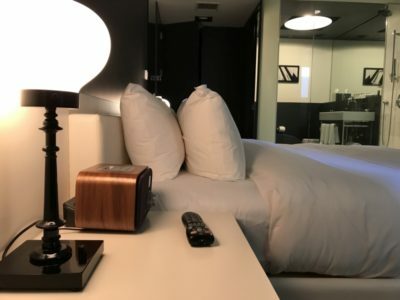 I like the site re AVIOShotel points and how to collect but these “reviews” of FREE hotels and FLIGHTS are worthless IMHO and bring the credibility of the site down. I was a Carlson Gold and they gave me the worst room in the hotel. They got what they deserved. 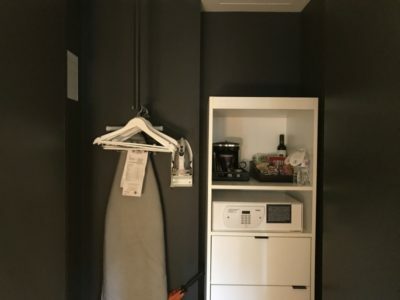 Would they give us the worst room in the hotel on a review trip? No. But that isn’t our fault. We can’t ask to be given the worst room in the hotel despite having status. The reviews are MORE honest to the extent that we get to see other parts of the hotel that you wouldn’t normally get to see unless the hotel gave you a tour. Do we get better treatment on a review trip? Quite possibly. But we can’t influence that. You will see, in other reviews, that when we are upgraded to a suite (eg Turnberry) we insist on seeing standard rooms and photographing those too. I’ve stayed in this hotel. It’s a nice one, very well located, good service. I don’t recall any street noise. Boston is pretty expensive all round. I travel there occasionally for work and hotel occupancy generally seems to be high. I’ve also travelled there several times on leisure with family and friends – Airbnb is the way to go. Whilst it is touted as being close in feel to a European city, I don’t think the similarities run particularly deep. You answers astound me and TBHO show you have no idea about how to be non biased in reviews, but purely chasing these freebies. It is if you ask for a FREE room for (assumingly) a” review” of their hotel. The hotel are bound to give you a nice room and give you better treatment. 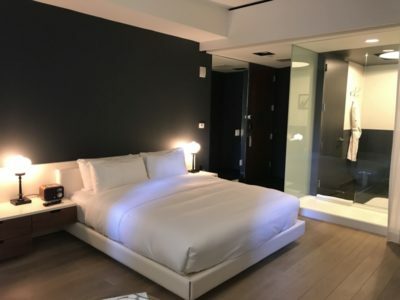 I’ve stayed in hotels (paid for) and have asked to see other rooms so I could compare when i return. Hotel is quite happy to do that. Stick to Avioshotel point collection -you’re good at that. Or review hotelsairlines when you pay for them and the hotel is non the wiser-Like Mayfair. But then of course you would not get those freebies…..
We lose a HUGE amount of money on review trips. The InterCon Ljubljana cost me about £300 in flight costs, taxis etc even with a free room. I also lost my entire staff for 3 days. We don’t do them for freebies – Anika works for me and basically goes where she is told, in the nicest possible way, in the same way that you do what your boss tells you to do. I am probably £1,500 out of pocket on incidental costs relating to reviews that Anika has done this year. Boston was slightly different in that I saved some money (as she would have needed a hotel irrespective) but normally reviews are just a cash drain for us and done as a favour to readers. I doubt the fact that I saved a few quid vs me spending a few quid made any difference to how the review was written.